The owner of a plane that crashed in Iowa has been identified as a Wisconsin man. Authorities say three men died in the Tuesday morning crash in northwest Iowa. 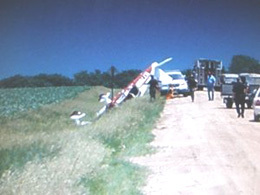 The one-engine, four-seat plane crashed west of Sanborn. Thunderstorms packing high wind gusts were in the area, but Federal Aviation Administration spokesman Tony Molinaro says it&apos;s not yet known if weather was a factor. "All we have right now is that there were three fatalities and we do know the owner of the aircraft," Molinaro says. A Wisconsin man owns the plane. F.A.A. records indicate the aircraft was registered to Jerome H. Goodger of Milton, Wisconsin. A deputy at the scene reports there were "long guns" in the plane, which means the men may have been on a hunting trip. Officials don&apos;t know where the plane was headed. "Doesn&apos;t look like…the pilot did file a flight plan, so at this time we don&apos;t know where it was coming from or going to," Molinaro says. O&apos;Brien County Chief Deputy Sheriff Allen Schuknecht says they don&apos;t believe the victims were from the area and all three have a different last name. The F.A.A. spokesman says he can&apos;t say much about the situation. "With fatalities…our investigators gather all the information…and we give all that information to the N.T.S.B., the National Transportation Safety Board, and the N.T.S.B. is in charge of the investigation and then they&apos;re the only ones that can talk about the investigation itself," Molinaro says. The crash site is just off a gravel road in a farm field. When local officials arrived, they found the plane partially resting on its roof with all three passengers inside. "There was some weather coming through at the time of the crash, but we are not sure at this point," Deputy Schuknecht said of the cause of the crash. F.A.A. records indicate the plane, a Piper Cherokee, was built in 1968. UPDATE: The O&apos;Brien County Sheriff&apos;s Office has identified the three victims as 64-year-old Francis Allegretti, Cambridge, WI; 60-year-old Thomas Boos, Fort Atkinson, WI; and 65-year-old Malcolm McMillan, Milton, WI.